C.H. 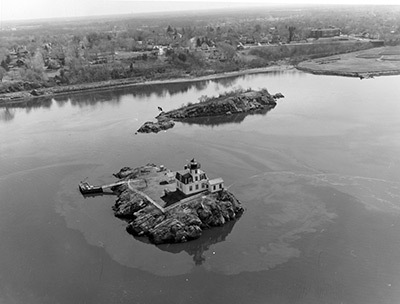 Salisbury, the first keeper of Pomham Rocks Lighthouse (1871 to 1893), was no doubt faithful to his duties based on his long tenure (22 years) at the offshore sentinel, but he also appears to have been proficient at helping save lives along the Providence River as well. According to the Providence Evening Press, during a three month period from May through July 1876, keeper Salisbury was credited with saving six lives. “Yesterday afternoon Mr. James Brown (formerly a police officer of this city) and his brother-in-law took a small boat at Cedar Grove wharf and started out to fish. They had not proceeded far, when, by some means, their boat upset and they were both in the water. Capt. C.H. Salisbury of the Pomham Lighthouse saw the accident and immediately set out to rescue the victims. Two other men who also saw the accident went to the assistance of the parties in danger. They succeeded in getting Mr. Brown’s brother-in-law ashore, and resuscitating him.